After spending overnight at the hospital hooked to an IV with rehydrating fluid, my son appeared better. He did not vomit anymore but that could be attributed to the 'rationing' I did - that is to give him only 2oz of milk whenever he demands it. His diarrhea still continued through but with long intervals between poops. Nevertheless, we spent another night which was difficult as the toddler already feels restless and it was apparent he wants to remove the strange looking thing attached to his right hand. We had to cover his left hand too so he had no means of pulling out the IV insertion. He did not vomit the whole of Sunday and his poop started to become mushy (sorry to be so descriptive) like the consistency of a peanut butter. It's a good sign! Also, all his lab works (blood test, urinalysis, fecalysis) turned out normal. We were discharged on Monday with the doctor's final diagnosis as Acute Gastroenteritis. Due to the negative lab results, the doctor could only guess that perhaps he has ingested food that didn't agree with his tummy. The first night back home turned okay with no episodes of vomiting but at 5am the following day, I was awakened by a strong smell of poop and by my son's crying. I got up and felt his diaper soaked in poop. His diarrhea was back and it's now watery compared to the mushy consistency he had when he was in the hospital.. Needless to say, it was worse than before and it puzzled me because he was also taking medications. The diarrhea continued until past 10 in the morning and I began to really worry about him getting dehydrated again. Also, he has not eaten any solid food since he became sick. We hurriedly prepared to go to the hospital again, but something at the back of my head told me to seek other options. A magtatawas. The magtatawas/manghihilot is referred in the area as Manang Inday, a woman in her sixties who lived in a subdivision near our village. She is known for her ability to heal those afflicted with usog, bati or unexplained illnesses. 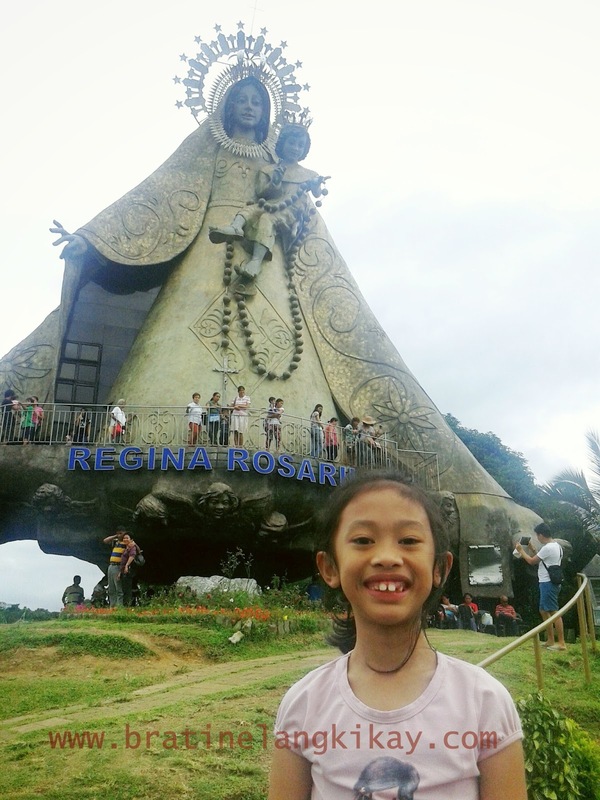 When she saw my son, she held his palm and immediately told me, 'Nabati sya ng matanda'. She gave me a small slice of ginger and asked me to have my boy hold the ginger for a few minutes while she probed further my son, much to the tot's disapproval (and he started squirming and crying loudly). She then got a bottle filled with various roots and oil. It must be her concoction of 'healing solution'. She applied a generous amount on my son's tummy, back and the soles of his feet. Afterwards, her son, a man in his early 20s and who must have been used to his mother's routine, took out a basin filled with water, a metal ladle (sandok), white candle or esperma and match. 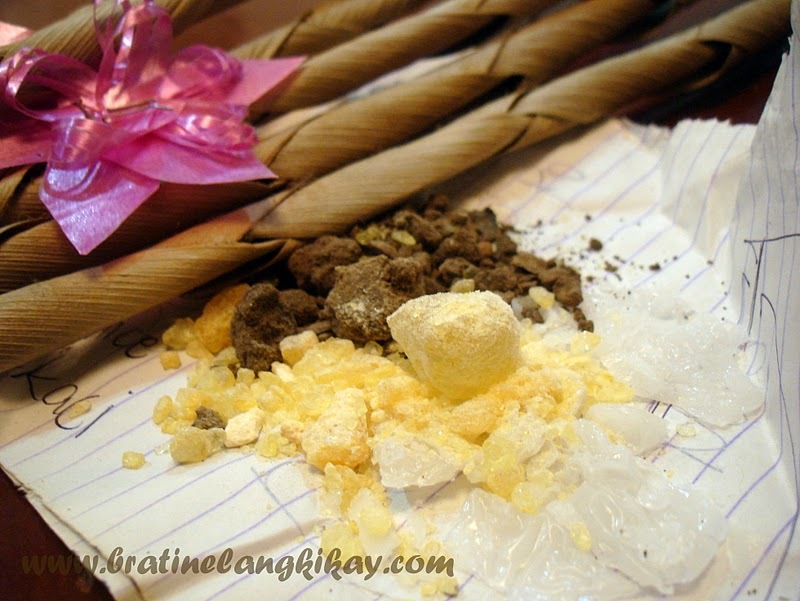 I knew these materials very well having undergone tawas many times during my childhood when I still live with my grandma. These are for performing tawas. Aling Inday cut the candle into small pieces but left a short portion and lit it. The candle bits were then placed on the ladle while she heats it over the lighted candle. As the candle melts on the ladle, Aling Inday murmurs some 'prayers' or incantations. As soon as all the candle bits melted fully, she threw the melted liquid into the basin of water where it formed an image we couldn't comprehend at first. Aling Inday picked up the formed candle from the water and showed us a figure we right away identified as a lady, hmm, well, it does looked like a lady. She told us it was a old lady, her hair were all white and pulled together in a bun. It could be anyone from our neighborhood who may have greeted or noticed my son. We thanked Aling Inday and gave a small donation. A Magtatawas do not explicitly ask for money or payment for their services although they accept donations of any kind or any amount. We were given the formed candle wrapped in paper and was instructed to place it under my son's pillow overnight. The following day we burned it together with frankincense and myrrh (insenso at kamanyang) mixed with a piece of palaspas (palm fronds blessed from the recent Palm Sunday). As soon as we reached home, my son asked for milk and slept for 4 hours straight. He woke up a little before 5pm and asked for milk again. I watched closely while he finished his bottle in case he vomits. Then I invited him to come down with me to the living room where his sister is playing. I looked at him and he seemed better. From the time we arrived until he woke up, he didn't poop anymore. I offered him a slice of banana and kept my fingers crossed that he would even take a bite. He ate the whole slice and asked for more. I became excited and took out some grapes and oranges too which he all ate with enthusiasm. Believe it or not, that same night at dinner, my son ate his first proper meal since he got sick. Not only that, he seemed very hungry and he even ate part of his sister's dinner. That really amazed me because prior to his visit to Aling Inday, he didn't even want to bite his Oreo. Also, his poop went back to normal immediately like there was never a diarrhea that happened. Was it coincidence, a stroke of luck that my boy immediately got better (like magic) after seeing a magtatawas and removing the usog? I don't know. I would like to believe his healing was through a combination of answered prayers from our friends (and my mom's group of prayer warriors) and the removal of a negative energy through the magtatawas. When I look back at the series of events, I wouldn't change a thing. I would still have my son checked first by a medical specialist and be given medical attention. Then when all else seem to fail, I would still go back to Aling Inday as a last recourse. "Usog" or balis is a topic in psycho-medicine in Filipino Psychology (but considered just as a Filipino superstition in Western Psychology) where an affliction or psychological disorder is attributed to a greeting by a stranger, or an evil eye hex. It usually affects an unsuspecting child, usually an infant or toddler, who has been greeted by a visitor or a stranger. In some limited areas, it is said that the condition is also caused by the stranger having an evil eye or masamang mata in Tagalog, lurking around. This may have been influenced by the advent of the Spaniards who long believed in the mal de ojo superstition. Once affected, the child begins to develop fever, and sometimes convulsions. Supposedly, the child can be cured by placing its clothing in hot water and boiling it. In most other places, to counter the effects of the "usog" the stranger or newcomer is asked to put some of his or her saliva on the baby's abdomen, shoulder or forehead before leaving the house. The newcomer then leaves while saying: "Pwera usog... pwera usog..." The saliva is placed on the finger first, before the finger is rubbed on the baby's abdomen or forehead. The stranger is never to lick the child. The practice is that the stranger or visitor is asked to touch his or her finger with saliva to the child's body, arm or foot ("lawayan") to prevent the child from getting overpowered ("upang hindi mausog").